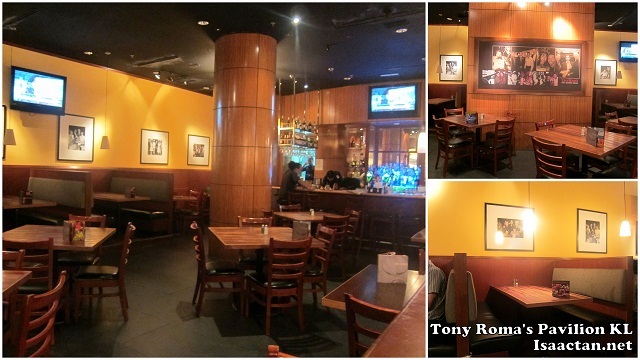 Tony Roma's, I've been to this chain restaurant a couple of time before at their other branches. It so happened the other day I was at Pavilion KL with Sherrie, a fellow outstation blogger who came to town, when we decided to crash in at Tony Roma's. The place itself seemed fairly nice and all, but after our short meal there, I found myself feeling shortchanged as I could actually get better food elsewhere at their price. With a tagline that reads "Ribs, Seafood, Steak" I would assume the steaks here were pretty good, hence I went ahead to order their Ribeye Steak, medium done. It took some time to arrive, and while waiting for it, we were served with some bread. Check it out below. If you have been following my previous posts, recently I've tried quite a number of steaks at various restaurants around KL, so I have a pretty good idea how a nice juicy piece of steak is suppose to taste like and Tony Roma's ribeye steak pales in comparison. It came in a nice big plate with fries and coleslaw on the side, but upon cutting into the meat, I was pretty disappointed by the absence of the juicy taste. I had to pile on some steak sauce to flavour it further. Now luckily the other dish that arrived, the Meatball Sausage Pasta was good, which made our Tony Roma's dining all better again. With generous amount of meatballs, pasta, and spices, I couldn't get enough of this dish as it tasted really good. Unfortunately I could not have it all as it was Sherrie's order! Overall, it was an okay meal, one which satisfied our stomach, but not really our taste buds. For an established chain such as Tony Roma's I came in with such high expectations, but left feeling slightly shortchanged or maybe it's just this particular outlet. I agree, the Tony Roma's here isn't as good as the one in Singapore. (Of course, they serve pork bacon, which could be why I'm biased....) Although I still enjoy the beef ribs there, along with the sauce they provide. The pasta looks good though! Not nice kah? Expensive, of course lah! So famous. I've always wanted to eat here but never had the chance. Hey! How come you never took me to eat at such places when I went to KL? Hmmmm...will bring the sweet young things only eh? Wink! Wink! LOL!!! It's okay la. I always go for the burgers only. I love TR's Fried mushroom. A bit too salty the meatball pasta. hehe. Steak is nice though. wow.. the steak is good..
i think the problem with many chains in malaysia is that they cannot sustain the quality and upkeep with the maintenance.. the more expanded their business, the worse they become.. sad huh? ?